Big Bear lake is a man made lake. All of the published history to date, including this author’s book Vanishing Big Bear, tells us that Big Bear Lake was originally created when a Redlands farmer by the name of Frank Brown built a rock dam across the narrow gorge at the east end of Big Bear Valley in 1885. However, recently uncovered documentation now shows us that this version of Big Bear history is not entirely accurate. Big Bear Lake actually existed long before Frank Brown ever built the rock dam. This reason for this confusion began back in 1845, when Benjamin Wilson, along with the some other Riverside ranchers, rode into the San Bernardino Mountains chasing local Native American Indians who had been stealing large quantities of live stock from their ranches in Riverside. It has always been assumed that Big Bear Lake didn’t exist at that time, and that the lake Wilson was referring to in his memoirs was the natural lake at the east end of Big Bear Valley which we know today as Baldwin Lake. The swamp he refers to was thought to be what is now the bottom of Big Bear Lake. However in 2004, documentation surfaced that provided details of an early government survey of Big Bear Valley that was completed in 1878. This survey was made many years before the dam that created lake was built, but it was also after Ben Wilson had named Big Bear Lake. The 1878 survey shows that a small, but natural lake already existed in the swampy west end of Big Bear Valley. The survey maps refer to it as “Lower Bear lake”, and that it was located just north/east of today’s Gilner Point. Baldwin lake is also listed on their map as “Upper Bear lake”. It is now believed that when Ben Wilson picked the name Big Bear Lake, he was actually referring to the small natural “Lower Bear lake”, not Baldwin Lake. Years later in 1885, when Frank Brown’s rock dam was built, he didn’t actually create a new lake, he increased the size of an already existing lake to about ten times it’s normal size. Frank Brown was a Redlands citrus farmer who’s first claim to fame was to organize other farmers in the area, and incorporate the City of Redlands on November 21, 1881. Soon after that he started looking for a reliable source of water to supply their thirsty citrus farms. Frank spent the next two years on horseback searching throughout the San Bernardino mountains for the ideal location for a reservoir. As soon as Frank saw Lower Bear Lake and the narrow gorge at the west end of Big Bear Valley, he new that his search was over. Upon returning to Redlands, he obtained an exclusive 20 day option for $500 to purchase the lake site. Within that very busy twenty days Frank Brown made several trips back to Big Bear with investors, and organized the Bear Valley Land & Water Company. 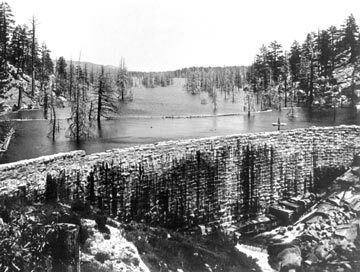 By July of 1883, Brown had construction workers cutting into the bedrock at Big Bear for the foundation of a new rock dam. Frank Brown’s rock dam was built at Big Bear Lake in 1885. — Rick Keppler Collection. Frnak’s dam was designed as a thin arch, 52 feet high, 20 feet wide at the bottom, and tapering to only 3 feet wide at the top. It was made entirely out of 3 foot rock blocks, weighing 3 to 5 tons each, they were cut from the surrounding hillside. Cement was used only to hold the blocks together. The construction of this rock dam was both unique and controversial. The dams strength would come from the shape of the arch. This narrow structure caused a very real concern among many of the investors as to whether or not it could hold back the enormous pressure of a five mile long lake. By the fall of 1884, the dam was finished except for the cap across the top. The workers went home for the winter. When they came back in spring, after another heavy winter, they found the dam still holding solid with a new 5 mile long lake stretched out across the valley where pine trees, green meadows, and a small natural lake had been the year before. Frank Brown’s dream of a reservoir for the Redlands citrus farmers was now realized. At a cost of $75,000, he had managed to build, what turned out to be at the time, the largest man made lake in the world. For over 25 years the rock dam at Big Bear Lake managed to hold strong until it was eventually replaced by the concrete multi arch Eastwood Dam in 1911. The old rock dam still exists today, usually under about 20 feet of water. 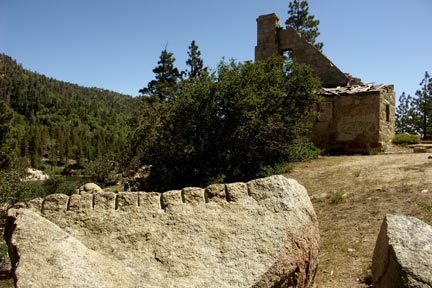 Today, hiking on the south shore hillside of Big Bear Lake, you can still find countless boulders that were split by hand in 1884, for the construction of the rock dam and the damkeepers house shown in the background. Notice the drill holes in the boulder in the foreground. This boulder was split by hand without explosives using a technique called Plug & Feather. On the south slopes of the mountains overlooking rock dam and the lake are the decaying remains of an old stone house. 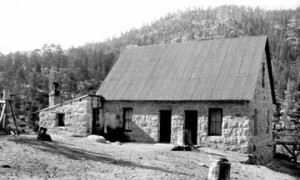 This house was built in October of 1890, using the left over granite blocks that had been cut from the hill side for the rock dam. From 1890, to 1977, this house was occupied by many different dam keepers and their families who performed maintenance and regulated the flow of water to Redlands. The most famous of these dam keepers was early pioneer Bill Knickerbocker. He lived here for nine years from 1909 to 1918. Because it was important to keep in touch with the dam keeper, the dam keepers house was also the location of the first phone line into Big Bear Valley. This is what the Dam Keeper’s house originally looked like after it was built on the mountain slope on the south side of Big Bear Lake. — Rick Keppler Collection. In 1977, the water company no longer needed the old rock house. It was donated to the forest service in the hopes that they would preserve it or possibly turn it into a museum at some time in the future. Unfortunately over the years, time and vandals have taken their toll, and it has fallen into serious disrepair.